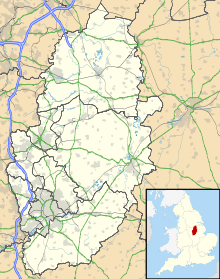 Retford Gamston Airport (ICAO: EGNE) is a small English airport, located 2 NM (3.7 km; 2.3 mi) south of Retford and close to Gamston, Bassetlaw, Nottinghamshire. It is used mainly for small private aircraft as well as a base for several private flying schools. Two AOC based operators IAS Medical and Diamond Executive Aviation are also based on the airfield. Retford (Gamston) Aerodrome has a CAA Ordinary Licence (Number P783) that allows flights for the public transport of passengers or for flying instruction as authorised by the licensee (Gamston Aviation Limited). Gamston airport was originally built as a Royal Air Force aerodrome with three runways in a triangular configuration (of which only one remains in common usage), and came into service in December 1942. It was part of the RAF Training Command as well as a 'satellite' to RAF Ossington, 8 mi (13 km) to the south. In May 1943 the field was transferred to 93 Group, Bomber Command Training. In June the same year No. 82 Operational Training Unit arrived with Wellington Mk. III and Mk. X bombers, Miles Martinets (used as target tugs) and Hawker Hurricanes. A year later the unit became No. 86 Operational Training Unit with a new role; night training for Wellington bomber crews. 1945 saw the disbanding of No. 3 Aircrew School and the arrival of No. 30 Operational Training Unit transferred from RAF Hixon, Staffordshire with more Wellington bombers. After the end of World War II all training ceased and the airport was closed. In May 1953 the airport was reopened as a satellite for nearby RAF Worksop and 211 Advanced Flying School (later No. 4 Flying Training School) was based there, flying Gloster Meteors and de Havilland Vampires. The airport is today owned and operated by Gamston Aviation Limited which purchased the operation in July 1993. Between closing in 1945 and re-opening in 1953, some motor racing took place in 1950 and 1951, organised by the Nottinghamshire Sports Car Club. It would appear that motor racing first took place at Gamston on 7 August 1950 on a 2-mile track. Main event of this meeting was a non-championship Formula One race in its inaugural season, which was won by David Hampshire in a Maserati 4CLT-48. He also set the fastest lap at 74.4sec (96.77mph). On August 19th 1950, Formula One made its second and last (non-championship) appearance for the 1st Sheffield Telegraph Trophy, which was won by Cuth Harrison driving an ERA. However, the following year, huge crowds attended meetings on Whit Monday (May 14th, 1951), and ‘Autosport’ of 27 July 1951 carried a report of a meeting run the previous weekend by the Sheffield & Hallamshire Motor Club. Reference was also made to improved amenities. Proceedings opened with a couple of sport car races over five laps on a shorter 1.9 miles circuit. The first of which saw Colin Chapman winning in one of his Lotus. Main event of the day was the 50-lap Formula Libre race, won by Bob Gerard in his 2-litre ERA who led from flag to flag. His only opposition appears to have come from Dennis Poore’s Alfa Romeo until it had plug troubles. Lap times were around 77secs, indicating a lap speed of close to 90mph. For his efforts Gerard won the golden ’Kenning Trophy’. Why racing ceased in 1951 is unclear but perhaps, there were strong rumours of the return of the Royal Air Force. This page was last edited on 26 December 2018, at 18:12 (UTC).